Lean in and listen closely, agents. We’ve got a new mission for you, and we’ll only say this once. Something is up in the world of aviation, and we need you to investigate. A few days ago, a small plane came down just outside London. It seems that the lone pilot was killed not in the crash, but by a jump with a sabotaged parachute. Perhaps this was some act of petty revenge, but it could be much, much more. The aircraft sported fearsome new technology – something that could tip the delicate balance of global power, and in 1969 that means potential disaster. We need you to discover who was behind this terminal departure, before the Cold War starts heating up. A Door In A Wall don’t actually do escape rooms, they create immersive mysteries, usually murder, in and around London. Some of their games will have you seeking out different locations within a walk-able distance of their venue, others will have it all under one roof. At least one of us has actually played every game of theirs since 2014 and this latest installment, Dead Drop, is fantastic. As we said, it’s not an escape room but we think you will love it. Arriving at the venue we were greeted by a groovy lady who explains what we need to do, provides us with a booklet each and shows us into the swinging sixties bar. The whole game is on one floor but with three separate areas that have been utilised and decked out really well. Other than players using their phones you can’t really see anything that doesn’t belong in the sixties. They have also put a good limit on the number of players. 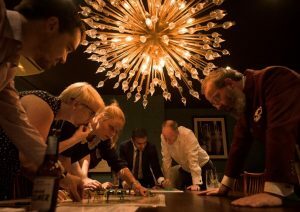 Sometimes, as with escape rooms, companies will see a room limit as the number of people who fit in a room but these guys know that doesn’t work. They were fully booked on our night but we had room to move around freely and didn’t get held up by other people too much. There are several actors dotted around who, when you know what to say to them, will interact with you and provide you information that will help you piece together what has happened to the victim. 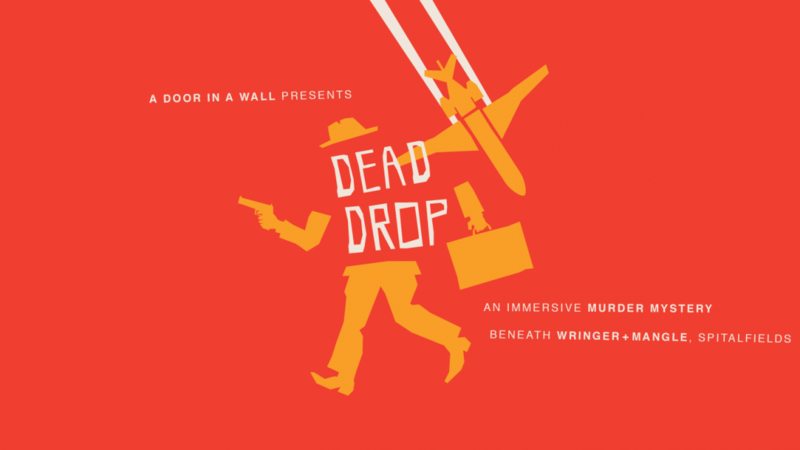 To know what to say to them in the first place you will sometimes need to solve a puzzle and the puzzles in Dead Drop are very thematic, which is great. They aren’t overly difficult but if you want to talk to all the actors then they’re the right level of difficulty we think. The actor interactions themselves are always excellent with A Door in a Wall games and this time is no exception, they do a really superb job. Want some negatives? We only came up with one and it’s not even that bad. We went on a preview night so in ADIAWs defense they’re still ironing out some kinks but there was one actor that we did have to queue for. That’s it. ADIAW have been improving this with every game though and they have put in some processes that allow some of the actors the deal with a couple of teams more or less at the same time without lessening the experience for either team. At the end of the day, if there are more teams than actors, a wait at some point is surely inevitable but the length of the game meant that despite that we still had time to see everyone we needed to. The game itself is 6:30pm to 10:30pm but the bar it’s in do food and we managed to find time to eat while we mulled over the information we had gained so far at that point and answer some of the questions in the booklet. It felt like it all unfolded at a good pace. At 10pm you hand in your findings and then an end scene ensues and a winner is announced. We all had fun playing Dead Drop. It’s a great, immersive mystery game with puzzles and deductive reasoning and we highly recommend you sign up to A Door In A Walls emails so you know whenever they release a new game, which is usually a couple of times a year.